A union for federal workers call the move "an assault on democracy." 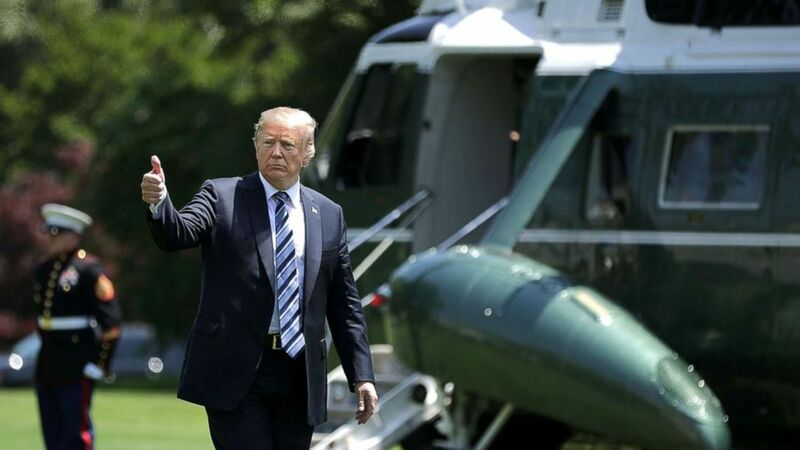 camera (Chip Somodevilla/Getty Images) President Donald Trump gives a thumbs up as he walks across the South Lawn after returning to the White House on May 25, 2018, in Washington, D.C. Trump delivered remarks at the U.S. Naval Academy graduation ceremony in Annapolis, Maryland. President Trump signed executive orders Friday that take aim at what White House officials described as an overly bureaucratic and extensive process of firing “poorly performing” civil servants. The orders would also limit the power and funding from the federal unions set up to protect them. The head of the largest federal workers' union said the Trump administration "seems hellbent on replacing a civil service that works for all taxpayers with a political service that serves at its whim." In a call with reporters, administration officials described the three executive orders taking a wide variety of actions, including rolling back the amount of time that "poorly performing" civil servants have to correct their behavior before being fired – and making it harder for fired workers to move to a separate agency. A second executive order will create a federal 'Labor Relations Working Group' intended to analyze government contracts with federal unions and remove "wasteful expenditures." The third executive order restricts the amount of time federal employees can spend on "union work," and aims to charge federal unions for rent space in federal buildings and eliminates their ability to expense their travel to the government. The order will also halt payments to unions specifically related to their time lobbying Congress. The officials pushed back on the idea that the moves were politically motivated, insisting that it was more about increasing efficiency in government and saving taxpayer dollars. White House Director of the Domestic Policy Council Andrew Bremberg said in a statement that the orders are in line with the public opinion inside the civil service itself. "Every year the federal employee viewpoint survey has consistently shown that less than one-third of federal employees believe that poor performers are adequately addressed by their agency," Bremberg said. "These executive orders will make it easier for agencies to remove poor performing employees and ensure that taxpayer dollars are more efficiently used." Federal worker unions quickly objected. The American Federation of Government Employees, which represents about 700,000 federal workers, issued a statement saying "President Trump is attempting to silence the voice of veterans, law enforcement officers, and other frontline federal workers through a series of executive orders intended to strip federal employees of their decades-old right to representation at the worksite." "This is more than union busting – it's democracy busting," AFGE National President J. David Cox said in the statement. "These executive orders are a direct assault on the legal rights and protections that Congress has specifically guaranteed to the 2 million public-sector employees across the country who work for the federal government." As for the amount of taxpayer dollars saved as a result of the orders, the officials said their current estimates predict that it will save taxpayers “at least $100 million” annually." They could not say just how many civil servants would be cut from the federal government as a result of the orders.